Listed here are 1:32 Scale Scalextric Sport, Digital and Classic track. Both Scalextric and Carrera track is listed in this category. Use the brand selector on the right hand menu to make sure you are viewing the correct brand you require. Confused as to which Scalextric track you need? 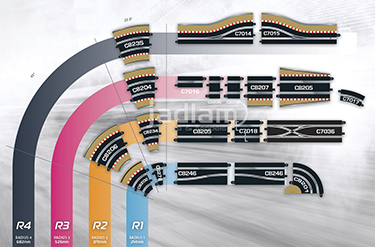 Click on our track selector image opposite to help you identify the track parts you require. If you require Micro Scalextric track (1:64 scale) please go to the Micro Scalextric category.